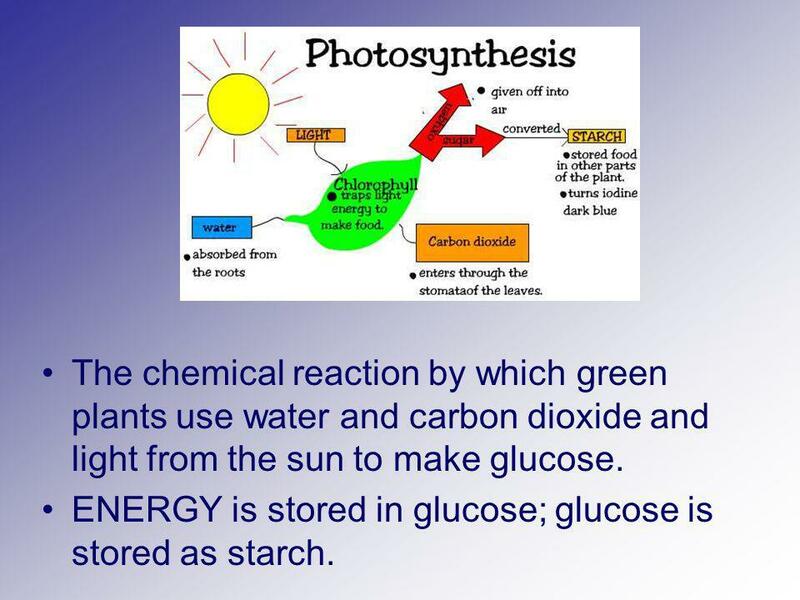 3 The chemical reaction by which green plants use water and carbon dioxide and light from the sun to make glucose. ENERGY is stored in glucose; glucose is stored as starch. 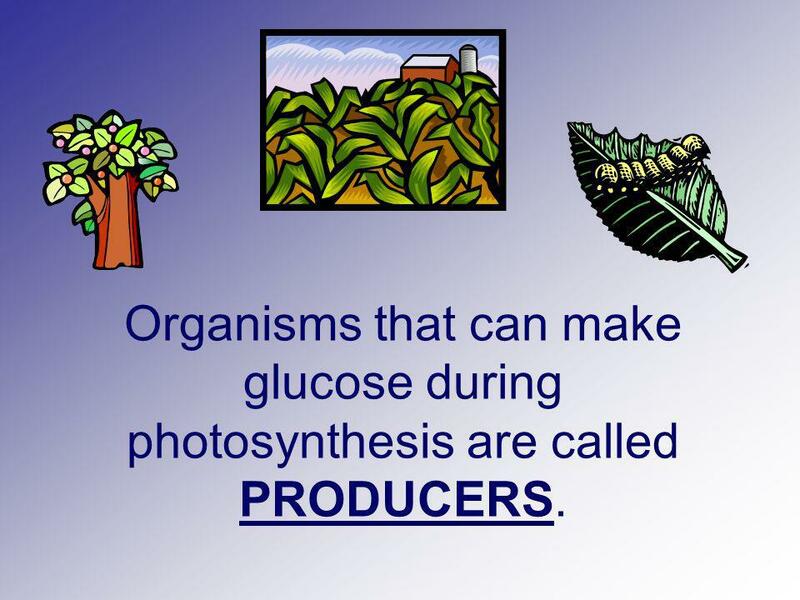 4 Organisms that can make glucose during photosynthesis are called PRODUCERS. 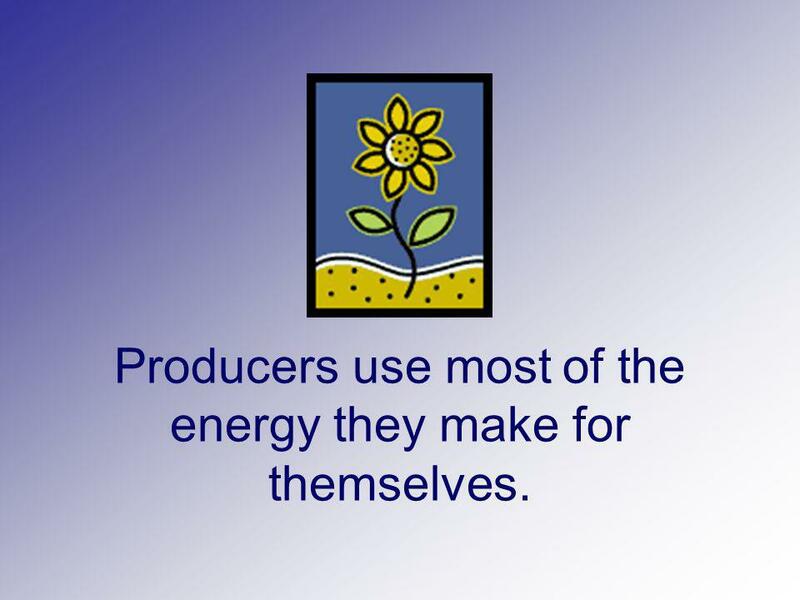 5 Producers use most of the energy they make for themselves. 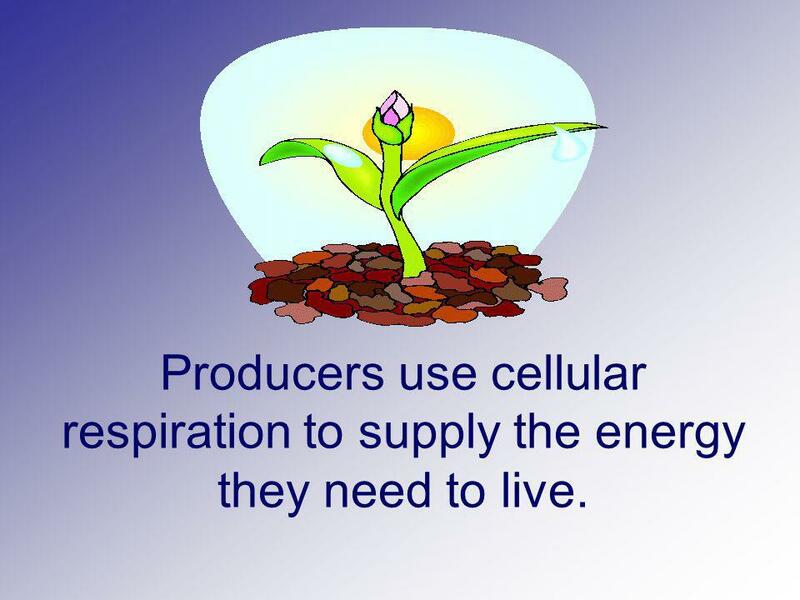 6 Producers use cellular respiration to supply the energy they need to live. 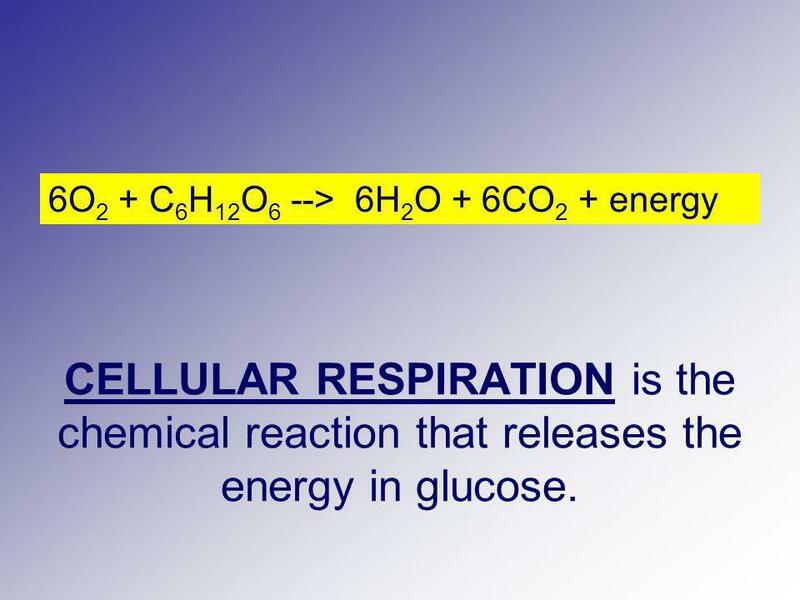 CELLULAR RESPIRATION is the chemical reaction that releases the energy in glucose. 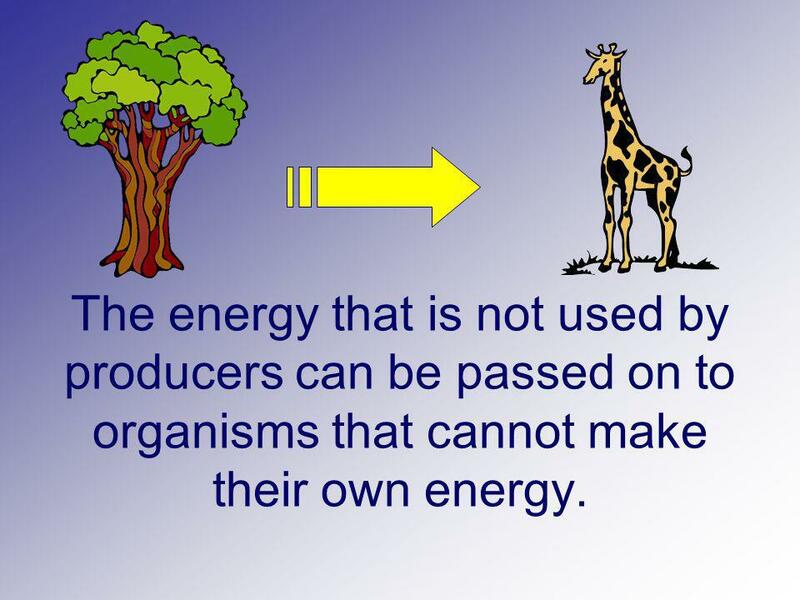 8 The energy that is not used by producers can be passed on to organisms that cannot make their own energy. 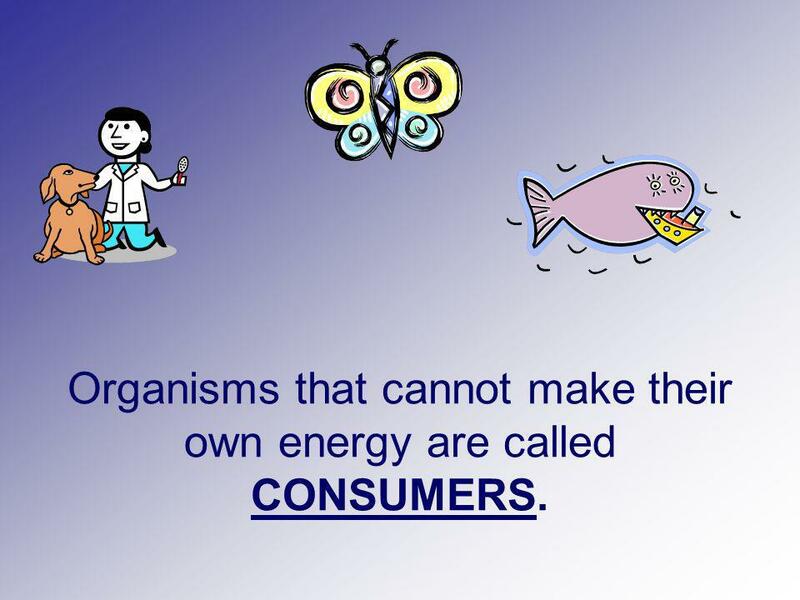 9 Organisms that cannot make their own energy are called CONSUMERS. 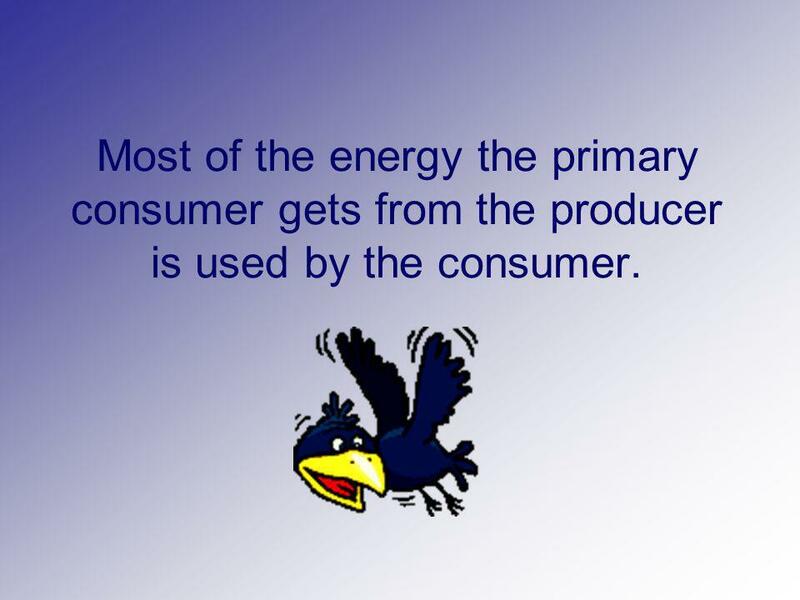 11 Most of the energy the primary consumer gets from the producer is used by the consumer. 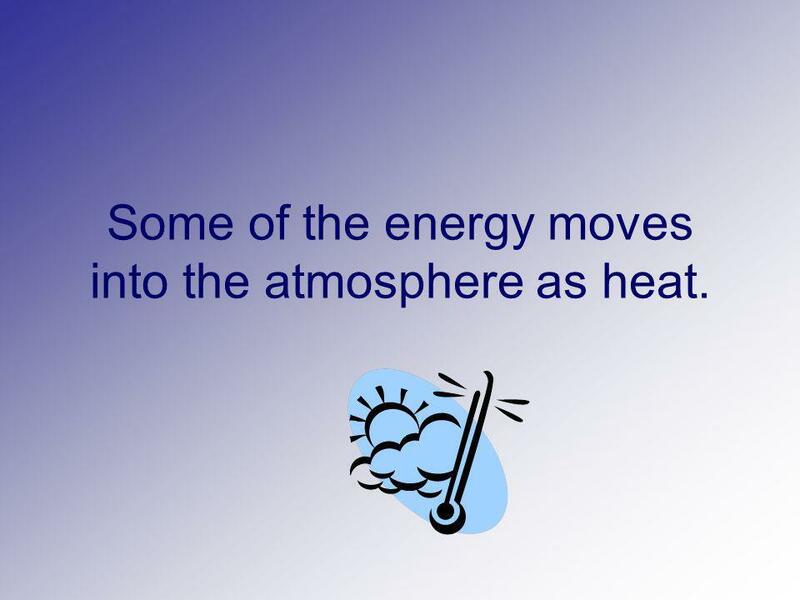 12 Some of the energy moves into the atmosphere as heat. 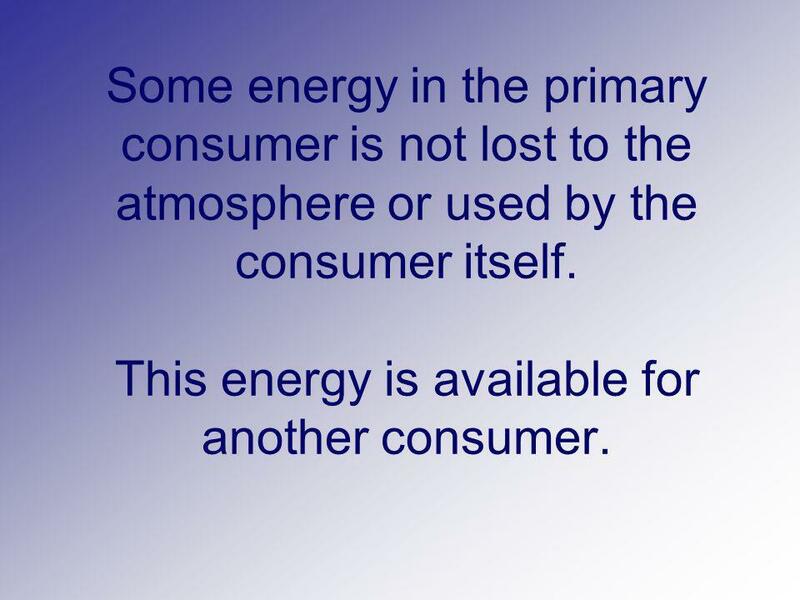 13 Some energy in the primary consumer is not lost to the atmosphere or used by the consumer itself. 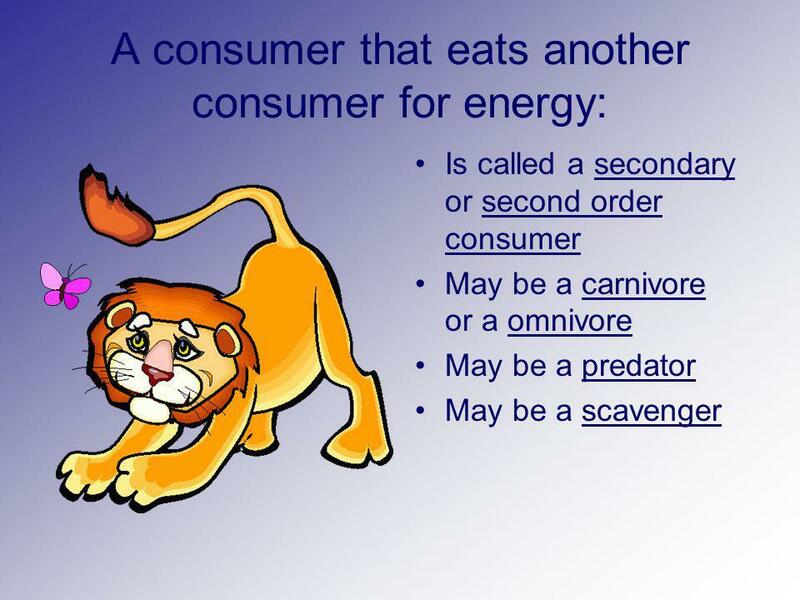 This energy is available for another consumer. 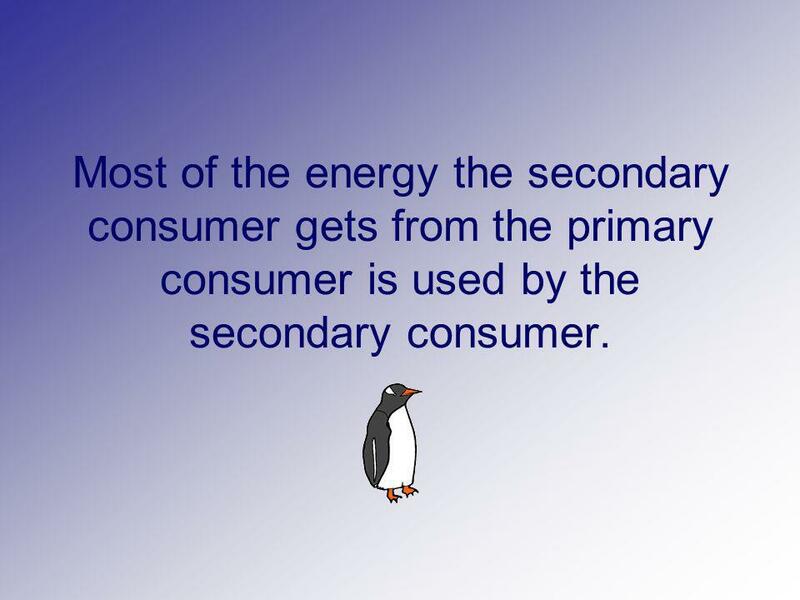 15 Most of the energy the secondary consumer gets from the primary consumer is used by the secondary consumer. 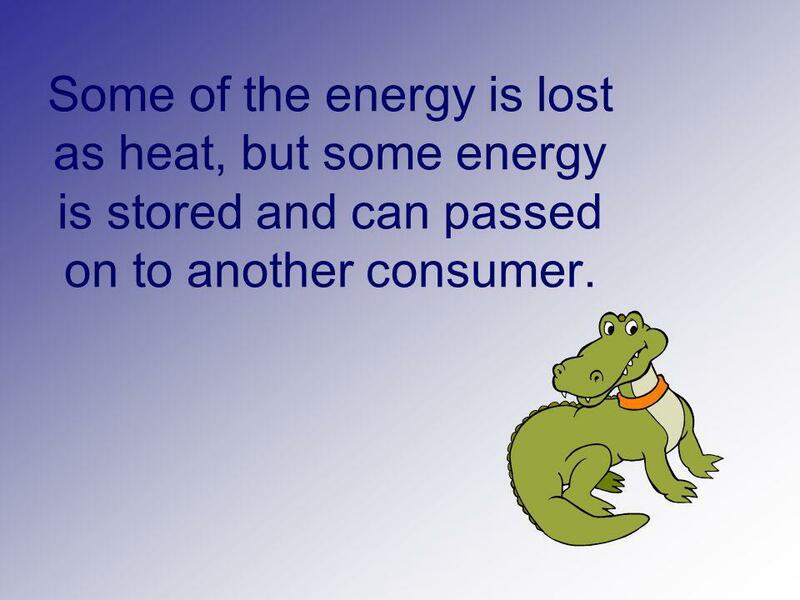 16 Some of the energy is lost as heat, but some energy is stored and can passed on to another consumer. 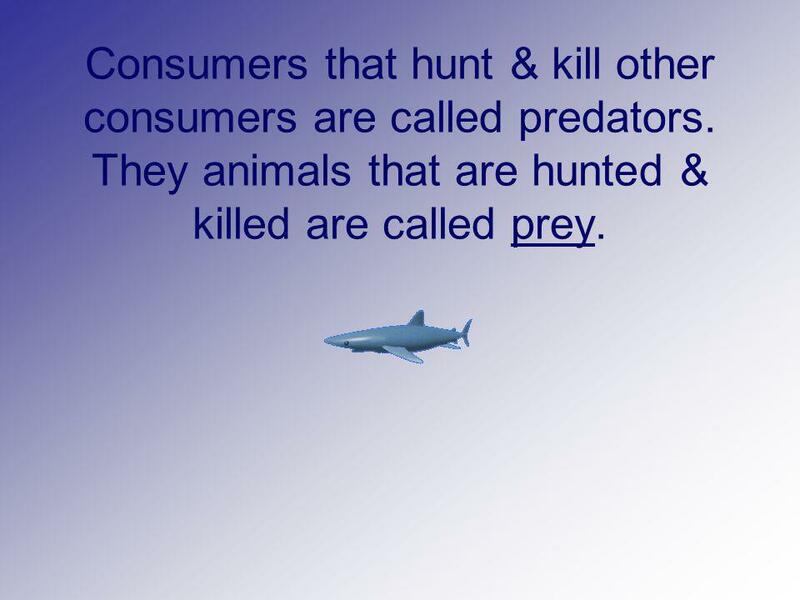 Consumers that hunt & kill other consumers are called predators. 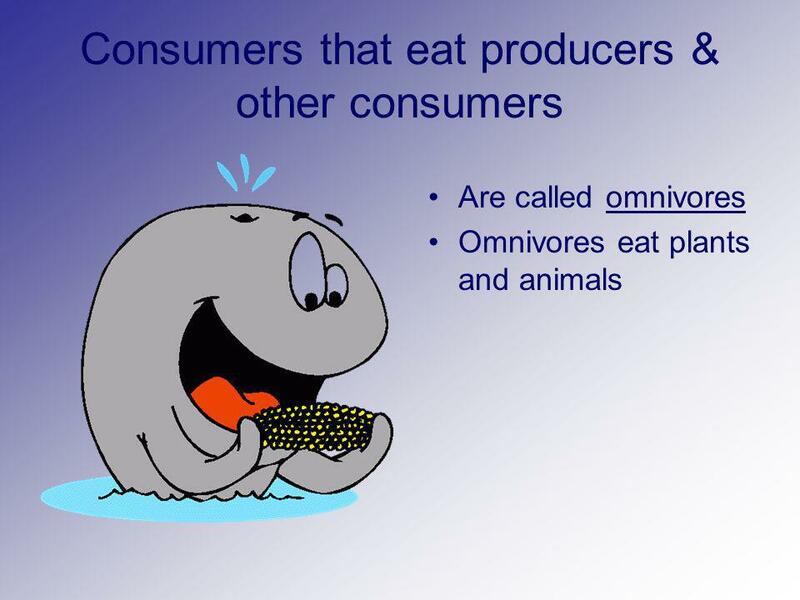 They animals that are hunted & killed are called prey. 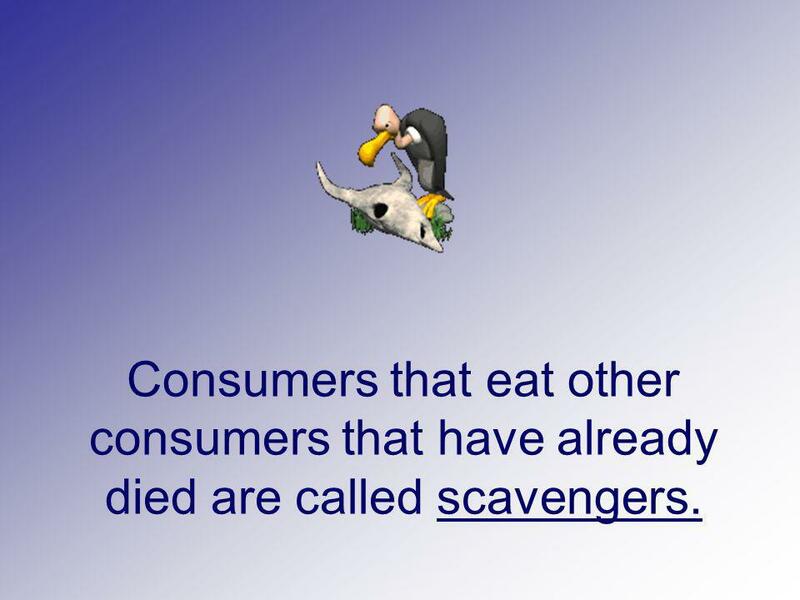 20 Consumers that eat other consumers that have already died are called scavengers. 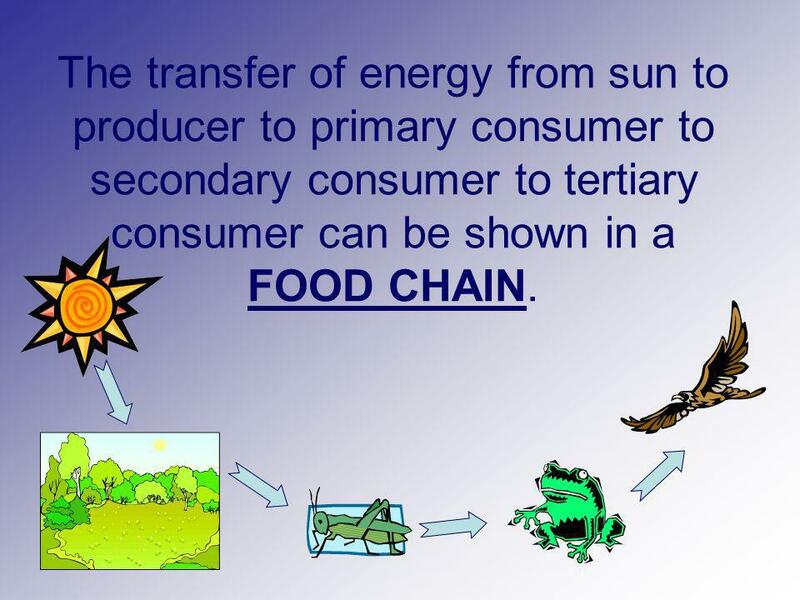 21 The transfer of energy from sun to producer to primary consumer to secondary consumer to tertiary consumer can be shown in a FOOD CHAIN. 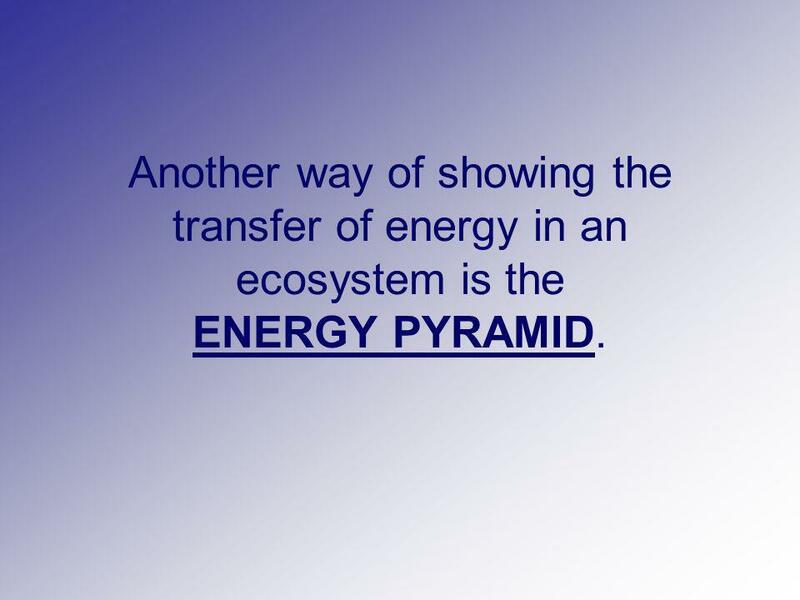 22 Another way of showing the transfer of energy in an ecosystem is the ENERGY PYRAMID. 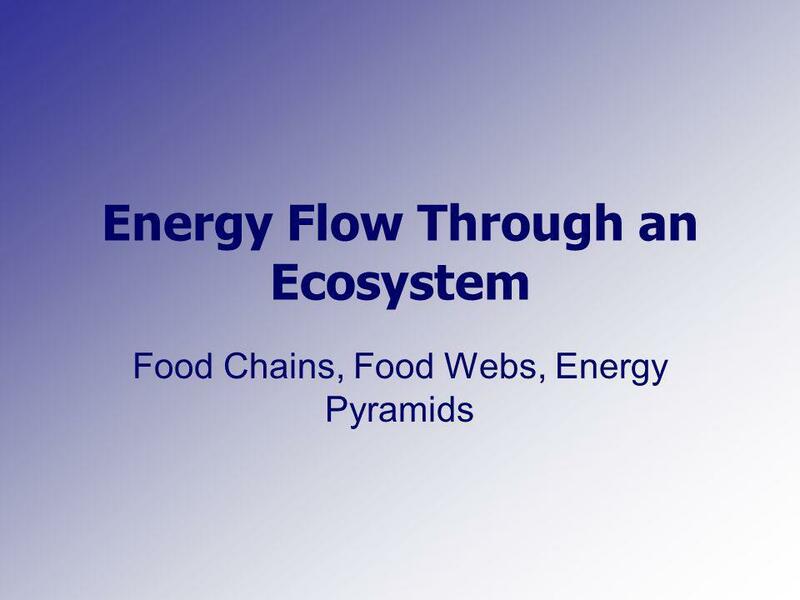 Download ppt "Energy Flow Through an Ecosystem"
1 Energy Flow Through an Ecosystem Food Chains, Food Webs, Energy Pyramids If you were in survival mode what is the #1 thing you would be in search of? ENERGY FLOW. All living things need energy to survive What is the source of that energy? The Sun! Living Things Need Energy. 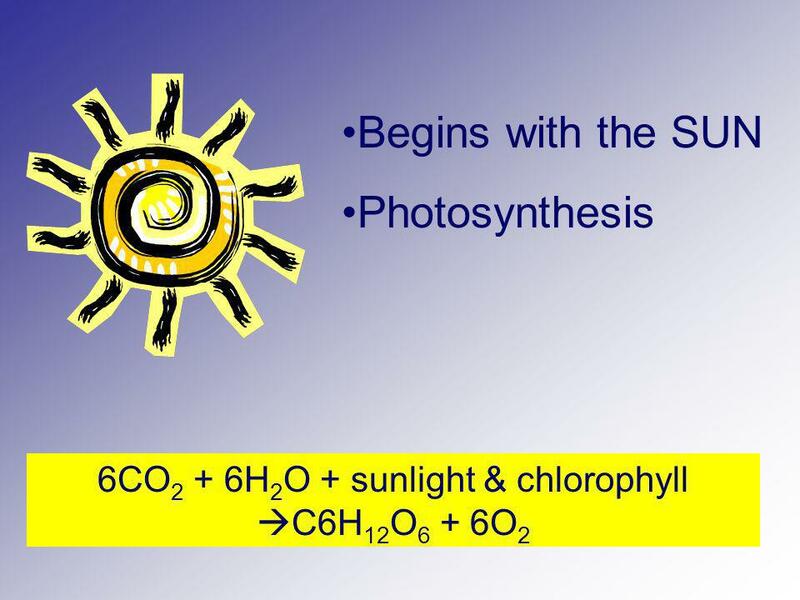 Energy  Sunlight is the source of energy for almost all living things. Name _____ 7__ Ch. 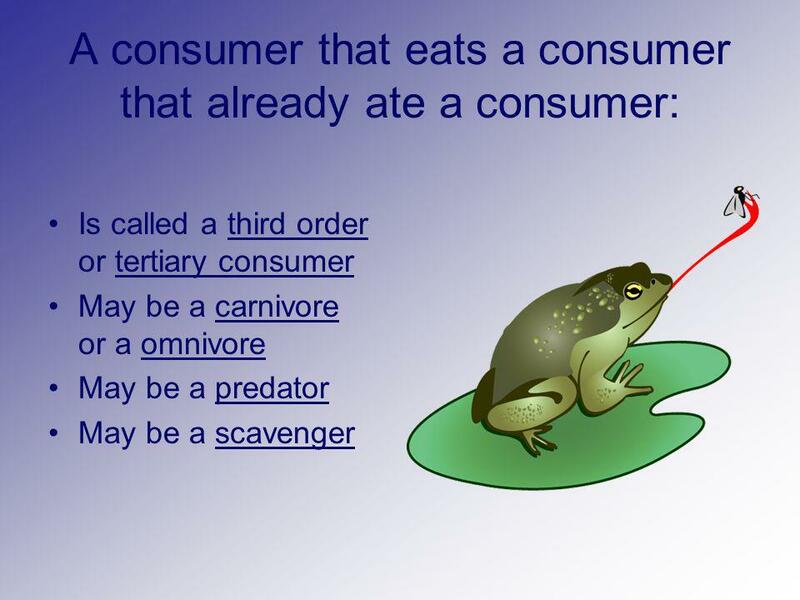 2 VOCABULARY Sept.__ Food Chains & Webs. Energy Flow Through an Ecosystem copyright cmassengale1. 1 Energy Flow Through an Ecosystem Food Chains, Food Webs, Energy Pyramids. 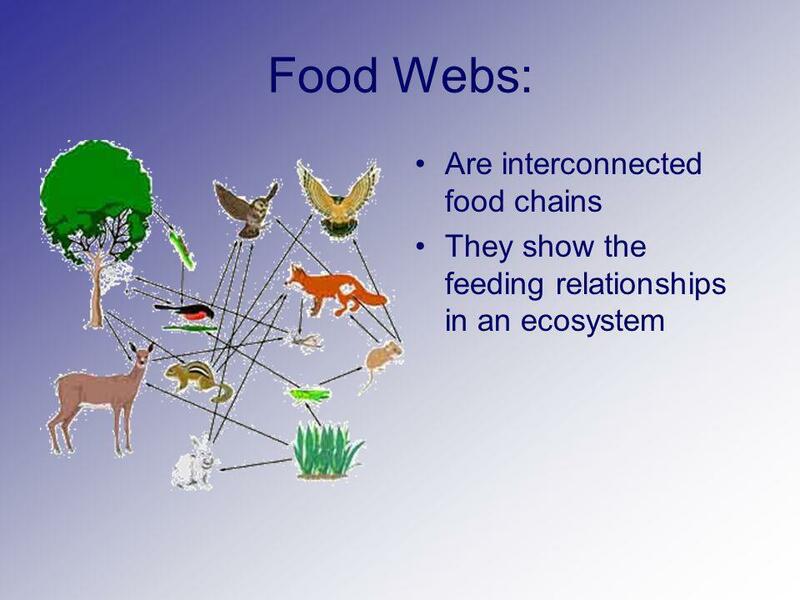 Energy Flow Through an Ecosystem Food Chains, Food Webs, Energy Pyramids. 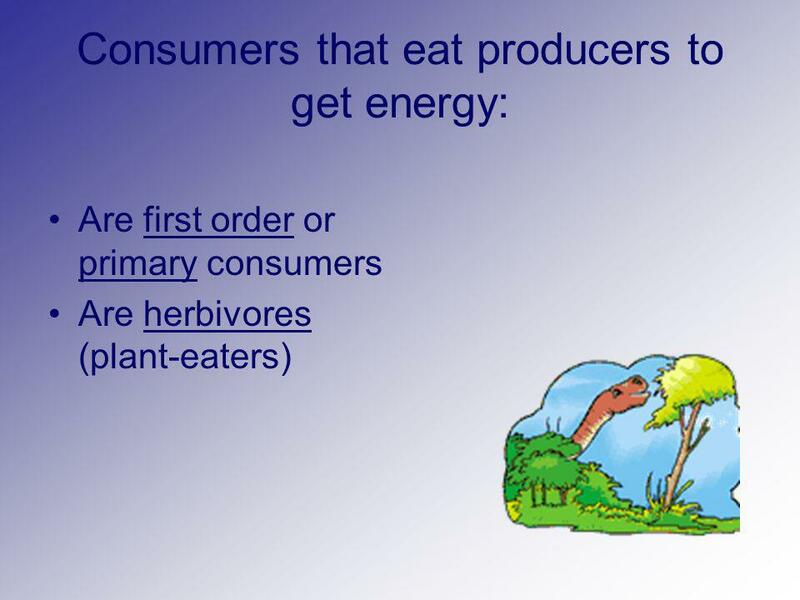 1 Energy Flow Through in Ecosystems Lesson 1 Food Chains, Food Webs, Energy Pyramids. Where does all of the energy come from? © T.P. Thould June 1999. 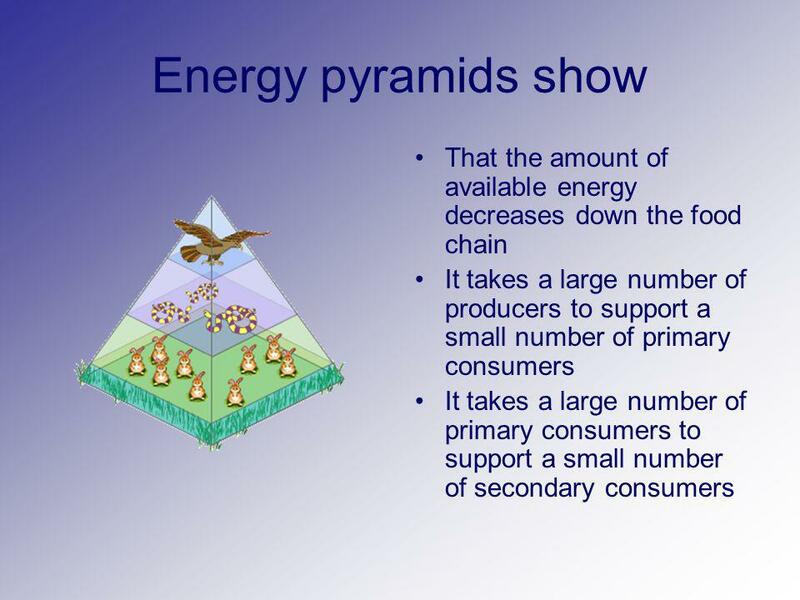 1 Energy Flow Through an Ecosystem Food Chains, Food Webs, Energy Pyramids copyright cmassengale. How is an organism’s energy role determined in an ecosystem? 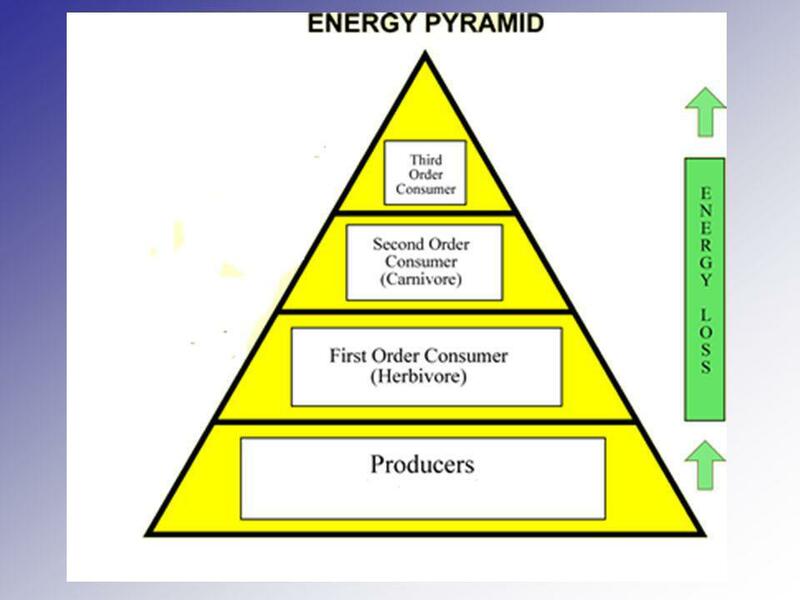 Energy Flow Through an Ecosystem Food Chains, Food Webs, Energy Pyramids copyright cmassengale1. Place on your desk: iPads—keep closed Crayons or coloring pencils Pencil.